Conduct research about four of the diseases/disorders you found that run in your family. Use two sources from two DIFFERENT web pages and submit the evaluations. Evaluate two sources that are NOT WebMD, Mayo clinic, or Google Medical. Check the box on the evaluation to send your responses to yourself so that you have a record of what you submitted. Check your evaluation scores and make sure there are at least two over 20. Any score below 20 will not count towards your project. The highest score you can receive is 25. Click on the image of the chart above to create your own copy in your Google Drive. Be sure to rename it with your name in place of the word "Copy" for when you turn it in you your teacher! 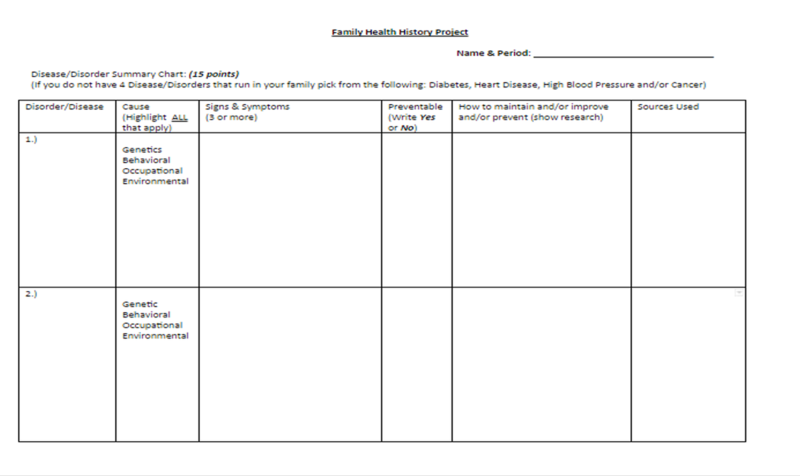 Complete the family health history chart for four of the diseases/disorders you found that run in your family.